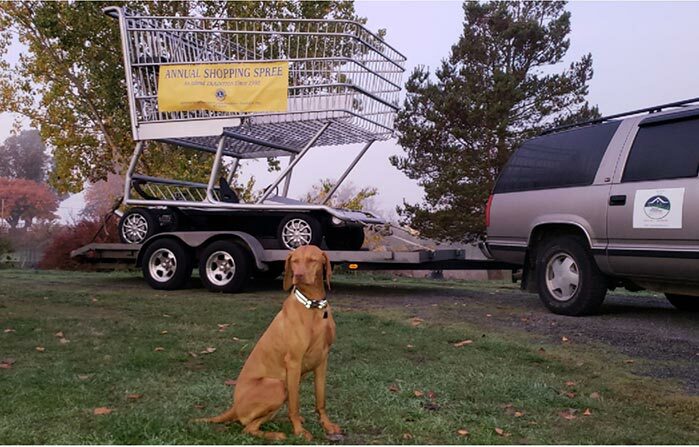 You will be seeing the bigger than life size shopping cart in town for San Juan Lions 29th Annual Shopping Spree. Tickets go on sale Friday, November 2nd & Saturday November 3rd at Kings Market and Market Place. (Only $1 per ticket or $5 per book of tickets) to Win a 4 Minute shopping Spree Run at Kings Market. Last year’s winner won $1,077 in a four-minute run…. The Lions Shopping Spree began in 1990 making this the 29th year San Juan Lions has provided this event which raises funds for Local Scholarships for graduating seniors that go on to higher education or trade school. 100% of funds raised stay local. We hope to see you and buy a book of tickets (ONLY $5) and you may win and also take your own photo next to the giant shopping cart. The Shopping Cart is 11 feet tall, by 8 feet long and 6 feet wide and can be driven as it has a VW engine. It is used in parades on the mainland and is owned by a supermarket owner, Marc Galland, in Montesano, WA who kindly allowed San Juan Lions Club use for the 29th Annual Shopping Spree.